Contemplate sock yarn leftovers. Wouldn’t some of the colors go oh-so-well together? Investigate the helical nature of knitting. Try knitting some jog-less stripes, remembering to go with the flow! Accept Lorna’s Laces‘ offer to create a colorway which blends all the helical sock colors into one (this step is optional, hehe). Consider ways to maintain proper tension across dpns; make a little video. 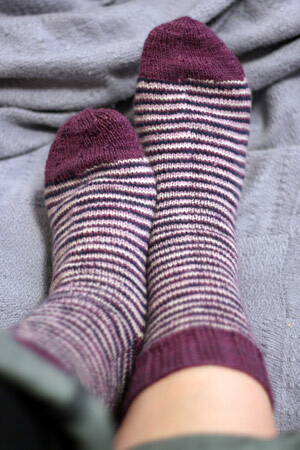 Finish the sock, wash the sock, and blog about it. BLOG about it. Grandma wants her birthday socks (even if 2 weeks late), so get out your camera and do it! I’m not sure why I needed a bit more of some accent colors than others, but in any case we’re definitely in the “leftover” category – I often have as much as 20 grams left over after finishing a large pair of socks (from a 100 gram skein). Just the main color needs more than scraps. Ladders: Present, but not important in the least ;). Now that is a cool pair of socks. Thanks so much for taking us through the creative journey with you! They came out great! It looks like self-striping yarn, but without the guesswork involved with avoiding pooling. Wow, those came out great! I usually hate heel flaps but those are appealing to me. You make me want to try and knit socks again! If I had to hazard a guess, I would think that some yarns used more because of the fact that you used one needle that was slightly larger. Correct me if I’m wrong, but with four working needles and four colors, each color would always be worked with the same needle.So maybe navy was knit off of the size 1 needle each time and lilac was knit on to the size 1 needle each time. I could be completely off base but I’m pretty sure the needles rotate clockwise by one section each round but so does the working yarn, right? I’d have to conduct a formal experiment with colored needles and correspondingly colored yarns to make sure. They came out great! I’m sure your grandmother will love them! I’m so going to try to make a pair soon! These are really cool, and I would have already tried making them if I weren’t using my sock yarn leftovers for a blanket and a tank top. The blanket happily eats up tons of the leftovers. Thanks for compiling this information onto one page! I started my own pair a few weeks back, and appreciate having everything in one place. I am going to try this. Yours are beautiful! Hmm….wish I had some solid-color leftovers. Those are GREAT! Love those socks. I plan to try some when my current sweater comes off the needles. YUM – Lovely, as usual, Kathy!! That is way better than self-striping yarn, and the stripes aren’t much harder to make. And you even get to choose the colors. I absolutely adore these socks and really, really want to try a pair. But I’m kind of scared. Although I think with your pattern and the book, I should be able to figure it out. As soon as I finish the socks I just started. Once again, your grandma’s a lucky lady! I LOVE those socks and thanks for introducing that technique to us! Gorgeous socks! These definitely need to go in my queue. Those look really great! I love how neat they are and thank you for adding how much you used of each yarn. I just went left-over diving for a pair of my own and that information helped immensely. They look beautiful and helical striping sounds so fascinating. Thank you so much for sharing! Fantastic! And thanks for putting everything in one place. I just finished the first sock in a pair for my sister…using yarn from a failed pair of mittens that were intended to be her xmas present. It looks awesome. I never would have thought of this without your inspiration! You have just renewed my interest in trying this with two circular needles. I’m really excited to try out some helical stripes. Yours turned out great. Thanks for all the tutorials! Those are really great looking socks! 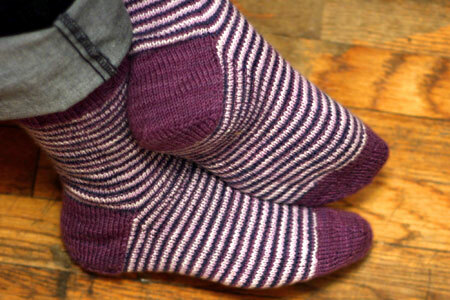 Thank you, Kathy, for this series about the helical stripes socks! I’m really looking forward to giving this a try. Love the way they look. Great tutorials. Thank you for sharing. Cool socks! (Unfortunately, the colors appear just purple and cream on my monitor, for some reason, but I saw the real colors in your earlier post). Really, really pretty socks. I bet they’re as comfy as they look! Your socks look amazing! Would you mind sharing a picture of what the inside of this sock looks like?? Just curious. Thanks alot for the inspiration! these are beautiful, kathy! lucky grandma! Wow. Those look too much like “work”. Just kidding.. they’re freakin’ awesome! Your grandma will love them ~ thanks for the video on tension and the great visuals on the helical process. After making several helix hats for Dulaan, I wondered what would happen if I made the color divisions uneven. The answer is–nothing since the colors travel and the color that had only a few stitches in this round may be long the next time. For instance: make Color A, three sts; Color B, three sts; and Color C finishes the round. It goes around to the end of A, where you knit three sts in A, and finish that round with B…and so on. Try it, it may make handling three colors simpler. I thought it did when making a hat in the round. For instance: make Color A, three sts; Color B, three sts; and Color C finishes the round. It goes around to the end of A, where you knit three sts in A, and finish that round with B…and so on. Try it, it may make handling the colors simpler. I thought it did when making a hat in the round. well,i think i know why you used more of one than of other color. gussets. first stripe will use more yarn than second, which will use more yarn than third and so on untill you decrease till original number of stitches. only then all stripes are again the same lenght.